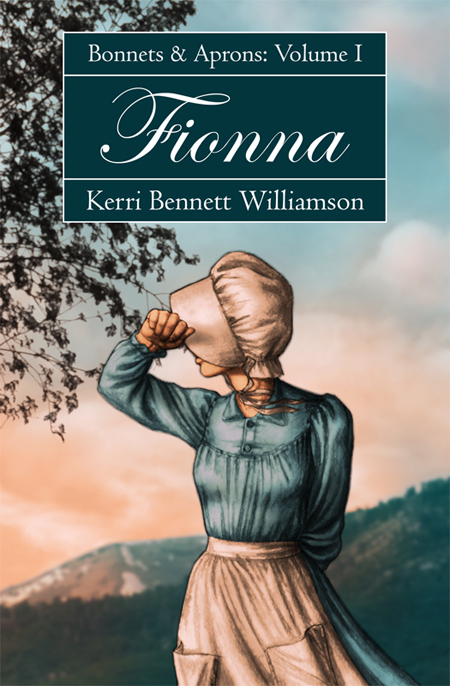 When I first talked to my daughter Brina about art for the cover of this first one, I suggested a prairie bonnet plus apron look, with no visible clue to hair color or facial features of the young lady. I wanted the reader to be left free to imagine their own image of what the main character looked like. The novel is written in first person from Fionna’s perspective and she never tells the reader exactly or even remotely what she looks like, so it was important to me that the cover reflected that. Since ‘beauty is in the eye of the beholder’, I decided to let readers conjure that up in their own minds. Interestingly, different readers have told me that they know what Fionna looks like as per my supposed descriptions in the book: that she has this or that look with especially this or that hair color. Their mind’s eye gave them a picture that they were certain I had described in complete detail. But I didn’t. Some thought her ‘brunette, because she is a strong young woman’. Some thought her ‘a redhead, because she has a fiery spirit’. Some thought her ‘a blond, because she has a gentle innocent heart’. I let readers think what they wanted. I chose to let Fionna appear outwardly whatever readers envisioned for themselves. There were many springboard inspirations for ‘Bonnets and Aprons’ (both Fionna and Mrs. Rutherford, which were originally written as one two part novel). When I started writing ‘Bonnets and Aprons’, it was a sort of ‘choose your own adventure’ for me, because it could have gone at least a dozen different ways. I had many story path ideas at the outset of the writing process. I only knew the beginning, not the middle or ending. I decided to just let the story unfold before me, and it did, taking me where it and its characters wanted to go. Many things I planned, went by the wayside. Other ideas took hold instead. I never knew what was going to happen next.